We’d love your help. Let us know what’s wrong with this preview of The Egyptian Antiquities Murder by Sara Rosett. October, 1923. Lady detective Olive Belgrave has a new case. Lady Agnes doesn't believe in curses--especially ancient curses--and she hires Olive to prove her uncle wasn't the victim of a malevolent mummy. Olive investigates and discovers the truth is much worse--it's murder. Can Olive debunk the curse and reveal the true culprit before the mummy cur Secrets Never Die . . .
October, 1923. Lady detective Olive Belgrave has a new case. Lady Agnes doesn't believe in curses--especially ancient curses--and she hires Olive to prove her uncle wasn't the victim of a malevolent mummy. Olive investigates and discovers the truth is much worse--it's murder. Can Olive debunk the curse and reveal the true culprit before the mummy curse claims another victim? 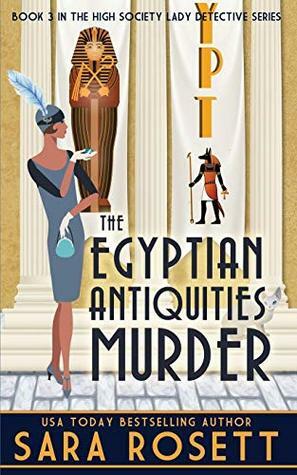 The Egyptian Antiquities Murder is the third book in the High Society Lady Detective series, a cozy historical series set in 1920s England. If you enjoy lighthearted novels reminiscent of the Golden Age of detective fiction with spirited protagonists and perplexing mysteries, you'll love the High Society Lady Detective Series from USA Today bestseller Sara Rosett. To ask other readers questions about The Egyptian Antiquities Murder, please sign up. This third installment had its good moments but for me did not match up to the fun I had with the previous two. It was pretty great in its own rights but with the expectations I had from it, it fell a little short but considering how it ended... I should start at the beginning, Olive is now being asked to solve mysteries thanks to the word of mouth praises that have gone around the more influential families in the country. This case is an intriguing one, it has to do with the obsession of the Br This third installment had its good moments but for me did not match up to the fun I had with the previous two. It was pretty great in its own rights but with the expectations I had from it, it fell a little short but considering how it ended... I should start at the beginning, Olive is now being asked to solve mysteries thanks to the word of mouth praises that have gone around the more influential families in the country. This case is an intriguing one, it has to do with the obsession of the British (at that time) with Egyptology, mummies and everything else that is part of it, as the title and cover page would attest. There are rumours of a curse hanging over the Mulvern household and Olive is now a guest trying to untie multiple knots. It may be the conspicuous absence of Jasper or of the Inspector for the better part of the book that might have reduced my rating because once they came on the scene, with the interactions involved, it took my enthusiasm up a notch. It is not that I do not like Olive and her steady methods of deduction but it gets funny and things seem to happen faster when people that she bandies words with, come into the scene. Once again I did not completely guess the culprit and did not feel like it either and only let the story take me on its way. This as always is something of a treat. There are hints that the next book might have everyone under one roof from the beginning and I cannot wait for that to happen! The Egyptian Antiquities Murder took me once again into a period in Britain that has always fascinated me. The period between WWI and WWII was an era of tremendous social change, not least for our High Society Lady Detective, Olive Belgrave. Olive was gently born and never expected to be left virtually penniless due to her feckless father's bad investments. Rather than retreating into the country with her father and his unwelcoming new wife, Olive is determined to make it on her own. In books 1 The Egyptian Antiquities Murder took me once again into a period in Britain that has always fascinated me. The period between WWI and WWII was an era of tremendous social change, not least for our High Society Lady Detective, Olive Belgrave. Olive was gently born and never expected to be left virtually penniless due to her feckless father's bad investments. Rather than retreating into the country with her father and his unwelcoming new wife, Olive is determined to make it on her own. In books 1 and 2 of the series, Olive has had some success investigating problems in "society" that could never be entrusted to the police or the lesser-born. She was delighted to receive a letter from the niece of Lord Mulvern who recently died. The police declared it a suicide, and the press speculated that it was the result of a "mummy's curse." His niece, Lady Agnes, declares that he had no reason to commit suicide and the mummy's curse merely is nonsense. What a wonderful peek into the past with a unique view of how the 1920's excavations and seeking the glory of the next big find in Egypt, along with how the ancient curses could have been manipulated to ones own advantage. Lady Agnes Mulvern has asked Lady Olivia Belgrave to look into her uncles supposed suicide as she cannot believe that he would end his own life. And the police will not look any further. We are led through a trail of leads, in which any one of several people who were at a dinner What a wonderful peek into the past with a unique view of how the 1920's excavations and seeking the glory of the next big find in Egypt, along with how the ancient curses could have been manipulated to ones own advantage. I enjoyed the new High Society Lady Detective series by Sara Rosett. I love that Olive is a strong independent woman finding her way. I feel as though I have lived in the 1920's even if just for a moment. I enjoy learning about the happenings and the lingo of that time period in England. Sara does her research and it shows. Her attention to detail shines through in her books. I have received an advance review copy. A perfectly charming mystery sent in the early 1920s when London was all abuzz with Egypt fever. Olive is called into help prove that Lord H's death was not caused by suicide or an ancient curse. Her sensible levelheadedness serves her well until she uncovers some family secrets that they don't wish to have aired. As always, I enjoy the subtle clues and slight misdirection that were the hallmark of the golden era of detective stories. Another delightful mystery featuring the high society lady detective Olive Belgrave. She is asked to discover who murdered Lord Mulvern. With plenty of suspects including his nephew, Olive knows she needs to solve this delicately. I enjoyed the new High Society mystery very much! Using the craze for Egyptology following the discovery of King Tut made for a very enjoyable mystery. Looking forward to the next one, I can't wait to see what happens between Jasper and Olive! USA Today bestselling author Sara Rosett writes cozy mysteries. Her books are fun escapes for readers who like interesting settings, quirky characters, and puzzling mysteries. Publishers Weekly called Sara's books, "satisfying," "well-executed," and "sparkling." Sara loves to get new stamps in her passport and considers dark chocolate a daily requirement. Find out more at SaraRosett.com and sign up USA Today bestselling author Sara Rosett writes cozy mysteries. Her books are fun escapes for readers who like interesting settings, quirky characters, and puzzling mysteries. Publishers Weekly called Sara's books, "satisfying," "well-executed," and "sparkling."